For many of Tony Bianchi’s customers, holographic boots, corsets and leather harnesses are part of their everyday look. A few blocks away from Union Square Park, a boutique called Gothic Renaissance has all the unique pieces needed to complete the outfit of every gothic subculture. One side of the store has petticoats, Victorian ballgowns and a wide selection of monocles to achieve the steampunk look. On a dimmer setting, another rack carries clothes that light up the room with its neon colors— the kind of aesthetics that might appeal to cybergoths. 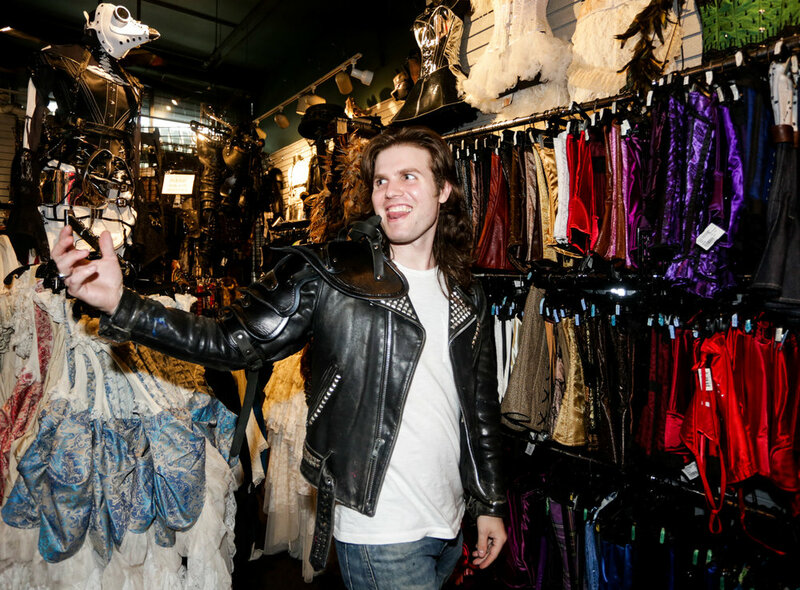 Adam Pyrate visits Goth Renaissance from Baltimore to check out new gear for his goth/trip wardrobe. In New York on Saturday, March 31, 2019. || Photo credit to Wes Parnell for EST. Bianchi said he and his wife Claudia wanted to set up a store that catered to people who weren’t “posers.” The idea was to offer people who considered the subculture a lifestyle exclusive, high-end clothing from local artists and events overseas like the annual Wave-Gotik-Treffen gothic music festival in Leipzig, Germany. After studying woodwork at the Philadelphia College of Art, now called the University of the Arts, Bianchi moved to New York City, the place he calls “the center of the world,” to start his career designing exhibits and showrooms while also attending trade shows. He never left ever since. He honed his artistic talents in mask-making and molding sculptures and even developed his line of masks. The thought of running a business didn’t come to Bianchi until a spectator advised him to set up a place where he could share his work. Goth Renaissance is New York's premier one stop shop for all goth and showtime needs. In New York on Saturday, March 31, 2019. || Photo credit to Wes Parnell for EST. Thirty years later, Bianchi still practices his craft, all while running two businesses that stand right next to each other. Gothic Renaissance is not a Halloween store, Bianchi owns another shop for that called Halloween Adventure. It started about 17 years before the Goth store, in 1981, as a storefront rented on a temporary basis in New York, New Jersey and Pennsylvania, which allowed Bianchi to cut down on real estate costs. Independent stores like Gothic Renaissance allow members of the goth community dress and express themselves better because items from mainstream stores can be repetitive, said Julie DePeaza, store manager for eight years. The store isn't just a safe environment for customers, but also to employees. Back in the 1980s, Bianchi recalled, employees at commercial malls weren’t allowed to have piercings. When Bianchi isn’t wearing his Batman costume during his occasional interviews about Halloween trends, he loves putting on rings half the size of his fingers and matching chain bracelets and necklaces, but one item that never goes away is his 30-year-old boonie hat adorned with ornaments like a feather, a severed hand and a unicorn horn. Each knickknack he adds every year symbolizes a memorable moment in his life. The trends around the goth community changed alongside shop culture and events, said DePeaza. The employees on the floor are responsible for monitoring trends and find pieces that would sell well in the store. A display at Gothic Renaissance in New York on Saturday, March 31, 2019. || Photo credit to Wes Parnell for EST. About eight employees work in Gothic Renaissance, all of which are can dress and style both mannequins and customers. Bianchi said some of his employees want to work there because they could wear whatever they want— chunky platforms, piercings or tattoos. Many of Gothic Renaissance’s customers attend local themed parties and art festivals like Burning Man. Celebrities would occasionally walk into the store, and sometimes staff members would find store products worn on TV performances. The 73-year-old artist admits he’s not a member of the goth scene. For that reason, finding the people who understood the goth community was the hardest part of running a business, said Bianchi. Many of the employees at the boutique have been in the goth scene for a very long time, said DePeaza. To a lot of teenagers, the store became a place of refuge, she said. The boutique’s aesthetic has attracted a diverse group of customers, from goths and drag queens to curious tourists and celebrities. || Photo credit to Wes Parnell. Nikki Lynn, 18, entered the store for the shoes she has never seen at the mall and left surprised by the number of leather garments she saw. It's becoming difficult to attract customers to come to the store when they can find everything on Amazon and other online retailers without leaving their house. But for Bianchi and DePeaza, there's nothing like trying on clothes in a store with a staff that’s willing to help customers find what they need. After decades of being both businessman and artist, Bianchi doesn’t plan on stopping anytime soon. He said he’s found the balance between both and wants to continue growing his stores organically.